It’s been a long time since I’ve worshipped anything beyond dumplings or doughnuts on Sunday mornings, but this weekend I joined Stockton’s Sikh community at their historic temple on Grant Street. The act of sharing food as spiritual devotion has deep roots in many of the world’s religions. At Buddhist temples, serving vegetarian food to the public is a way to raise money for community work. At Sikh temples, offering a meal free to anyone who asks is an act of spiritual generosity mandated by the religion’s founders. As I research immigrant foodways here in Northern California, I’ve been struck by how temples have emerged as the center of many of these transplanted communities. In the Bay Area, there are many temples where you can experience the intersection of devotional prayers and delicious meals. 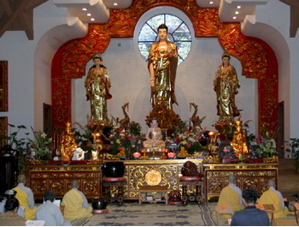 Chua Duc Vien is the only Buddhist temple run entirely by women in Northern California. The late Thich Dam Luu and the Vietnamese Buddhists she inspired, from small children to elders, raised money to build this temple by collecting and recycling cans, paper and cardboard for years. (Thich is Vietnamese for â€œVenerable,â€ the title of respect for monks and nuns.) Serving the large and well-established San Jose Vietnamese community, it offers a place of prayer and contemplation every day of the week. You’ll see women bowing with incense as part of their daily regimen next to families posing for celebratory portraits. If you’re exploring the nearby Vietnamese enclaves, it’s a peaceful place to rest after the bustle of Lion Plaza to the east or the sheen of Grand Century Mall to the north. For those tempting fate, there’s a small room to the side of the temple where you can pray for your fortune. Watch those before you to get the knack of tossing the numbered sticks — it’s all about the wrists — then find a friendly person to translate the corresponding message. The temple welcomes visitors, and on Sundays, the nuns erect a tent to serve vegetarian versions of popular Vietnamese dishes and special sweets such as banh cam, perfectly round, sesame-sprinkled â€œorange cakes.â€ On a recent visit, they were serving one of my favorites soups, bun rieu, with thin rice noodles, tofu puffs and fresh tomatoes. The food is neither fancy nor expensive, but all proceeds go to the nuns’ community work. This Stockton temple holds a place of pride for California Sikhs. Built on land purchased in 1912, it was the first gurdwara(â€œdoorway to the guruâ€) built in the U.S by early immigrants from the Punjab who worked in the nearby orchards and along the transcontinental railway. Since then, many other gurdwaras have been built, including the Gurdwara Sahib in Fremont and the impressive Sri Guru Nanak Gurdwara in Yuba City. All have kitchens that will serve food to anyone who appears at the temple and asks, no matter what time of the day or night. In Stockton, nearly 1,000 people flow through the lunch line every Sunday, and on important holidays, the temple may feed 10,000 to 20,000 visitors. One of the central institutions of the Sikh religion is the langar, the communal meal where volunteers help prepare, serve and clean. Sharing food emphasizes the equality and brotherhood of the Sikh religion. Requiring all community members and visitors to eat the same food together in the same room at the same time has special significance within the context of India’s historical caste system. Prayers and recitations accompany the meal, a reminder of the importance of a contemplative life. Simple but well-spiced, satisfying vegetarian food comes from the langar’s kitchen, including vegetable curries, flatbreads, dal, and fresh salads. Breakfast might be paratha with fenugreek greens, served with a generous dollop of whipped butter. In the afternoon, you might snack on caulifower pakora, dried dates and a selection of sweets with chai. Within the temple, you may also be offered karah prashad, a rich, sweet pudding made from flour, butter and sugar. Served after a priest has recited prayers, the prashad is holy food. Accept the prashad with both hands and be sure to to ask for a small amount if you don’t think you can finish all of it. There is no charge for the food prepared in the langar, and since Sikhs do not proselytize, you needn’t worry that their free meals are an attempt to convert you. When you visit a gurdwara, remember to wear clothing that allows you to sit modestly on the floor. Both men and women must cover their hair and remove their shoes before entering. 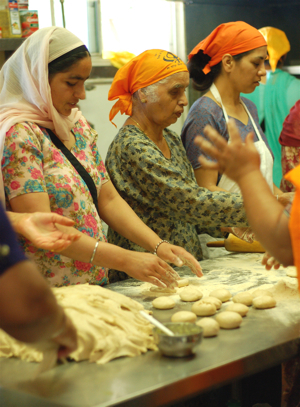 At the Stockton gurdwara: Making enough roti for a thousand hungry people involves ten women patting and rolling dough from 6 to 10 every Sunday morning. If you haven’t yet been to Berkeley’s Thai Temple, then you’re missing one of the best community meals in the Bay Area. It’s pretty well established, so you’ll need to arrive before 11 am to beat the lines. Tables are arranged in long rows in the shade of the temple complex, built with money raised by these weekend feasts. During holidays, dance and song are background to the meal. On regular weekends, it’s one of the best places to experience the food-stall feel of Southeast Asia right here in California. The Thai monks and the amazing women who cook the food have it figured out, from the handy silver tokens to the separate stations for drinks, desserts, soups, rice plates and — not to be missed — the papaya salad cut and pounded to order. (Go ahead and ask for it spicy, and don’t forget the little marinated crabs.) Other treats include luscious coconut-scallion cakes and lemongrass sausage. During mango season, remember to save space for the sticky rice and fresh mangoes. Fortunately, the stalls pack food to go, so you can enjoy seconds and desserts later. If you’re expecting the best Thai food in the world and if you don’t like eating at communal tables…well, this isn’t the scene for you. But if you can appreciate real people cooking and sharing their food with you, then the Thai temple meals are a wonderful experience. Plan on going with friends and sharing. No subdued piety here. Since the dining area is set up outside and since the food is not part of a service, it’s a casual, fun meal that still goes to a very good cause.